1) What Tools are required? 2) Will the product track “black” on my expensive Burberry rug? Possibly. But, as a rule of thumb, EZ Street cold asphalt tends not to stick to clean shovels, clean shoes, etc. But, just exercise caution. Depending on the weather conditions (hotter makes the product more fluid), the liquid component of the EZ Street cold patch will stick more. So, when it doubt, check the shoes at the door. 3) Can I seal over EZ Street cold patch, and, if so, how long do I have to wait to do the sealing? Generally, our customer consensus is: provided you use a high quality sealer, and wait a minimum of 30 days prior to sealing, you can seal over EZ Street cold patch. 4) Why is it Black? Asphalt comes in 3 colors, black, black, and black. Well, truthfully, asphalt derives its color from the liquid component of the product. 5) What is EZ Street cold asphalt made of? The highest quality ingredients, consistent of a refined gradation of rock and sand, and a proprietary polymer formulation (the secret ingredients). 6) If I get some on my hands, what is the best way to get it off? Hands down (no pun intended), we all use WD40. 7) Is it available everywhere? We would like it to be, so, please recommend it to your friends and relatives at all dinner parties and sporting events. We have distribution throughout the country, in many retail hardware stores. For a current listing, please check the section of this website Where can I get it?. 8) Why does EZ Street cold asphalt come in a plastic bag versus a bucket? We try to do our share with this whole sustainability thing – to the best of our ability. 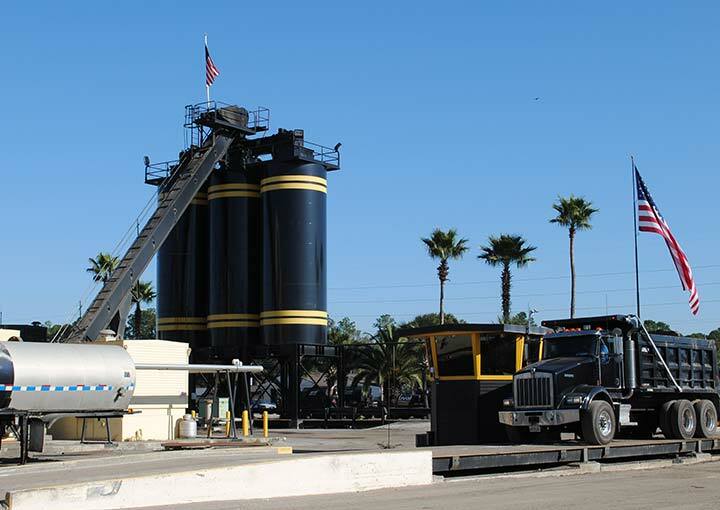 And, while you may find EZ Street cold asphalt in other formats around the world, we generally favor this flexible format because it a) provides the best medium for our product to guaranty shelf life b) it carries well in this format and c) will take the least amount of landfill space up. 9) Will it work in a pothole filled with water? Absolutely. In fact, potholes filled with EZ Street cold asphalt that have water in them perform better than one that may have no water, but a lot of dust. 10) Should I clean the pothole out before I fill in with EZ Street pothole patch? Just try to get as much of the loose debris from the hole – the better you clean it, the better the performance. 11) Will the product compact or settle once it is in place, and if so, what do I do? Great question, and the answer is “yes”. 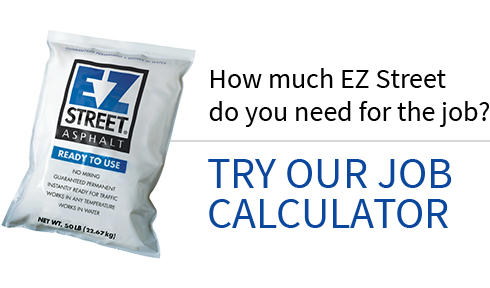 When filling any pothole or performing a repair of any sort with EZ Street, you’ll want to leave a small “crown” above it – to allow for compaction. How much? That will vary on the size of the hole to begin with, and the amount of secondary compaction (car traffic, etc. received after you patch). The more secondary compaction, the more settling. For a rule of thumb, a quarter inch “crown” seems to work well. The good thing though, is if you do get some additional settlement, you can always come back and put some more right over the top. 12) How long will the product last in the bag? A year. But don’t put off the project, ok.
13) Can I use EZ Street cold patch over concrete? Yes, it will stick to concrete, brick, and a variety of other surfaces. 14) Sometimes after I patch a hole, the product appears to be “soft”. Is there something wrong with it? Not usually, really. The asphalt component of EZ Street cold patch is a viscous liquid, that reacts quite interestingly to changes in temperature. When it’s a scorcher of a summer day out there, and you absolutely want to patch something, and you find that after you use the product, it appears “too loose” you can remedy this by sprinkling a bit of cement dust on the top of the patch. 15) How many bags will one pothole require? That’s a good question. In the 12 years we’ve been around, we’ve seen potholes that would house a family of four, with room for a guest house – (aka a lot of bags of EZ Street asphalt patch) to itty bitty tiny “divots” in the pavement that would take only a few ounces So, we’ve provided a simple (EZ) usage chart that will get you pretty close in estimating your project needs. 16) Can I get help from anyone on this by phone? You can always call us (and our help desk is in the United States) – on our nickel, and we’ll help you to the best of our ability, and, we’ll also be certain to ask you for a testimony, once you’ve used the product, and are happy with it. Call us – we’d love to talk to you. 1-800-734-1476. 17) How many potholes are in the roads? Ok, who wrote this? We’ve heard reports that there can be over 32,000,000 potholes on the roads at any given time. Yes, that is a lot of potholes. Asphalt is one of the most complex hydrocarbons known to man? It is obtained through the refinery of crude oil – and is one of the last products to be processed from a barrel of crude, thus rightly earning its description “from the bottom of the barrel”. 19) How do I get a free bag? You can’t. You’ll have to pay for it at the store. 20) How about some Trivia? Ok. Well, our website is visited by virtually every major country in the world (180 +), almost daily. We’ve helped patch potholes in Afghanistan and Iraq. We’ve been featured as a “Must Have” product in Popular Mechanics’ Magazine. 21) What is the coldest reported climate EZ Street cold patch has been used in? We’ve had reports of EZ Street cold patch being used in Siberia (Russia) where we understand it is always “very” cold.